More of the same from Apple, but boy, that same is ever so good! Apple has never been one to miss out on a marketing opportunity - and the arrival of the MacBook Pro 15-inch and its move to the Intel Core 2 Duo processor proves this. We were hoping this would see the base unit changed, but on the surface it's little more than a chip upgrade. We got our hands on the 15-inch model, which actually measures 15.4-inch in the diagonal, making it a widescreen display. If you need a desktop replacement, you can opt for the cumbersome 17-inch model, which starts at a less than appealing £1,999 (including VAT). The first thing we noticed about the screen was the lack of a Super-TFT panel. This isn't an oversight on Apple's part, because the company is allowing you to specify whether you want a standard TFT or Super-TFT at the time of purchase. This is a nice touch for buyers and one that other companies should consider following. The standard panel has a 1,440x900-pixel (WXGA ) resolution and offers pin-sharp - if not dazzlingly bright - images. You can't fault the build quality of the MacBook. Not only is it neat and trim, but it's full of wonderful little touches. Take the magnetic power supply; should you accidentally tug at the cord, it won't rip out and cause damage, but will simply detach itself. You'll be reminded of its brilliance frequently, we assure you. Powered by the Intel 2.33GHz Core 2 Duo T7600, this is the top-of-the-line chip and comes with 4MB of Level 2 cache as well as a 667MHz bus. Apple is claiming a 39 per cent speed boost in the MacBook Pro over the slightly older Core Duo chip. While our benchmark tests didn't see anything like this, the machine is quick, and runs even the most taxing of applications without any trouble at all. It shouldn't come as a surprise to you to find 2,048MB of DDR2 memory helping things along. If you're looking for a notebook that can replace your deskbound Mac, then this is it. The one aspect of the specification that lets the MacBook Pro down is its use of the ATI Mobility Radeon X1600 graphics card. In itself, it's a good mainstream GPU, but ATI has already upgraded it to the X1700 - which offers a 10 per cent speed boost as well as a host of powersaving tools - so we're rather surprised Apple didn't switch over to chip at the same time. With this amount of power under the hood, we were worried about the knock-on effect regarding battery life. We needn't have worried, however, because OS X has always been far more power conscious than Windows. Under test conditions we got well over five hours out of the MacBook Pro, which was mirrored in daily use by a similar lifespan, making this one of the best power managed notebooks on the market. You'll find an iSight, Apple's name for the built-in webcam, sat above the screen. It's a native 1.3-megapixel webcam, so you can take part in web conferences while you're on the move. Vodafone has also just released Mac support for 3G wireless. While it doesn't come as standard, add this to your MacBook Pro and you've the ultimate office-on-the-go. These extras aren't supplied by default, but you do get a remote control for use with Apple's media centre front-end Front Row. 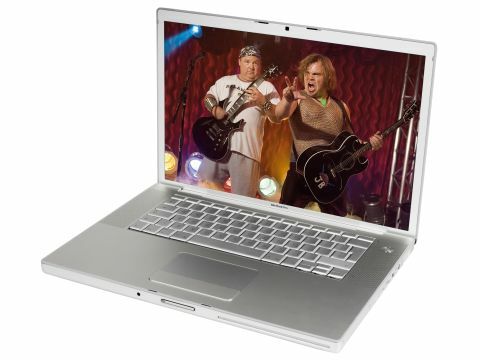 The Apple MacBook Pro continues a line of great laptops. The move to the Core 2 Duo is a logical step, which has already been followed by the announcement that the standard MacBook will sport the new chip. It's a great notebook, but crucially it's nothing new. We're left wondering when Apple will give the Pro line an overhaul, shave a little weight off it and generally give us something more than a mere update.